“I have been working at Qalaat Al Madiq hospital since it opened, about a year and a half ago. Our hospital is specialized in Mother & Child health care and is located in an area where you do not find many other hospitals and so we treat an average of 300 patients daily. Our hospital is right on the frontlines between areas controlled by the Government of Syria and by armed opposition groups. In practice, this means that usually, when a reconciliation deal happens between belligerents in different parts of the country, and when people are transferred to Idlib, they first transit here, in Qalaat Al Madiq. Every time this happens, we try to prepare as much as we can. So, a few weeks ago, when we were informed that people would start coming from East Ghouta, we got ready. We liaised with MSF and asked the organization to provide us with medical supplies and installations, in order to be able to handle more surgeries, rehabilitation sessions and to do referrals of patients to other hospitals in the region. MSF sent us a tent to triage the incoming patients as well as medical supplies and emergency preparedness kits. They also helped us with logistics and gave us technical advice. However, when people from East Ghouta started getting to Qalaat Al Madiq, we came under a lot of work and pressure. We were caught a bit off guard on the first day, when 5,000 people were dropped off in front of our facility! We were not ready to treat so many patients. Every time internally displaced people arrive in our area, we face the same sort of challenges and difficulties. But this time around, the number of people coming was just much bigger than what we had expected. More than 200 patients with trauma injuries arrived at our hospital in the first days: mostly people hit by bombings during the recent offensive, but also patients hit by gunshots. Additionally, we had to handle over 20 natural and caesarian deliveries. Our medical personnel were mobilized every day to handle this emergency. On top of trauma injuries, we were also diagnosing a lot of medical needs that should usually be treated by specialists. We had to deal with some children suffering from malnutrition, for instance. We did not have specialized health professionals to answer such needs, and we didn’t have a dedicated section in our hospital for this type of cases. We handled and treated as many patients as we could, while others were transported and referred as much as possible to facilities with the appropriate specialized medical departments. Though our hospital’s role was and still is critical in the frame of such emergency response, we really had to rely on other hospitals and organizations to provide people with the best assistance. "Our facility is relatively small and we just have one operating theatre, so we simply couldn’t handle this influx of patients on our own"
Our facility is relatively small and we just have one operating theatre, so we simply couldn’t handle this influx of patients on our own. For instance, at some point, one of the convoys got shot at on its way to Northwest Syria and we had eight patients with fresh gunshot wounds arriving all at once, straight from the bus. We would have needed two to three operating theatres to handle such influx of patients. 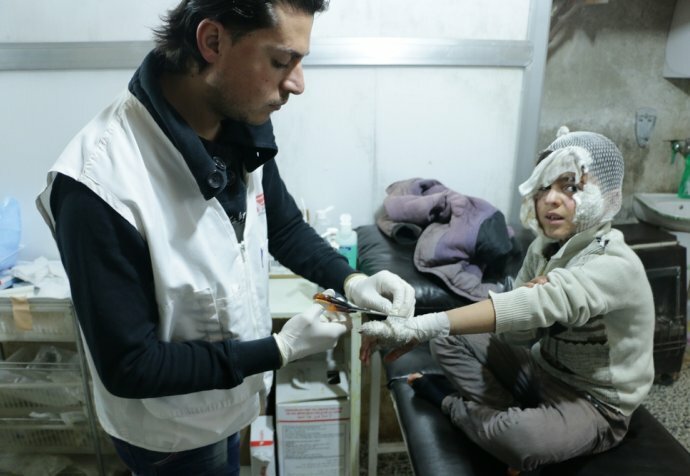 MSF has been assisting the provision of medical care to communities in the East Ghouta region since 2013. Unable to be physically present, the medical humanitarian organisation supported Syrian medics on the ground from abroad. In Northern Syria, MSF directly operates five health facilities and three mobile clinic teams and has partnerships with five facilities. The organization also provides distance support to around 25 health facilities countrywide, in areas where teams cannot be permanently present. 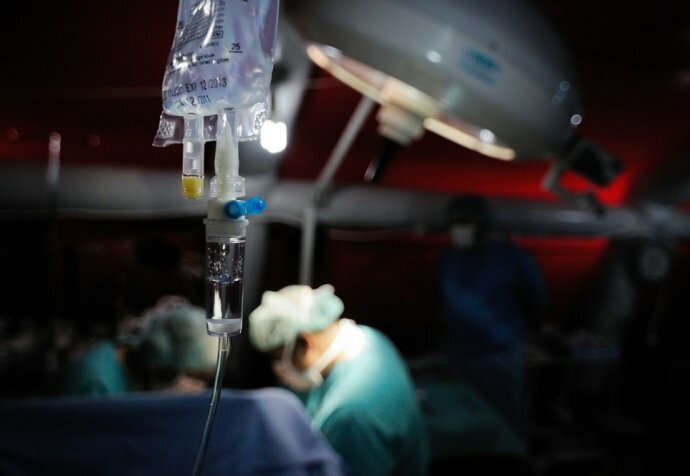 MSF’s activities in Syria do not include areas controlled by the Islamic State group since no assurances about safety and impartiality have been obtained from their leadership, nor can MSF work in government-controlled areas since MSF’s requests for permission to date has not resulted in any access. To ensure independence from political pressures, MSF receives no government funding for its work in Syria.